When indecision strikes.... sometimes my strategy is to take a completely unforeseen direction. I guess you could also call this ignoring the problem...? Details. There has been some progress on the cardigan front - I finally purchased the yarn for my Saddle Shoulder Aran. I actually ended up picking up (buying online) Classic Elite Skye Tweed on sale in a beautiful color that I was not able to pass on. Of course there is much Beaverslide still in my future, just not yet. There are some babies being born in the world. I wanted to make something for one. I've wanted to try the Knitters Almanac (EZ) February Baby Sweater for some time. Who is always one step ahead of me in all things Zimmermann? Well it seems like Elli is. She made this one and in doing so made my decision for pending-project a whole lot easier. its not much so far, just a garter stitch yoke. I would have knit more, but I'm taking a trip to Chicago this weekend and wanted to save the project for the plane. With such a wee little sweater, I had to control myself the last two nights or I would've probably finished before leaving on my trip (I don't have much room in my small bag for any in-progress large projects) (sock knitters, no admonitions necessary). the real reason I'm showing you this, is just to say that I'm happily consuming more of my Sundara stash. What a great experience it always is. Have you tried her yet? This is the worsted superwash merino somewhat solid "green over yellow." I had showed it to you as part of my Sundara haul a few months back. I am enjoying this way too much. Well, I'm off for what I hear is an even windier city than usual. Have a great weekend! I am just getting into EZ with a taste from the library. If I'm going to purchase one book, which would you recommend first? Great. Stop it. That is gorgeous. I have some Sundara yarn left over...I have a baby I need to knit a christmas gift for... just got that book...great, just great. Call me a brooklyntweed wanna be. What a gorgeous yarn- I just had to write and ask you which color that is? It is the lambswool that you are linking to, right? 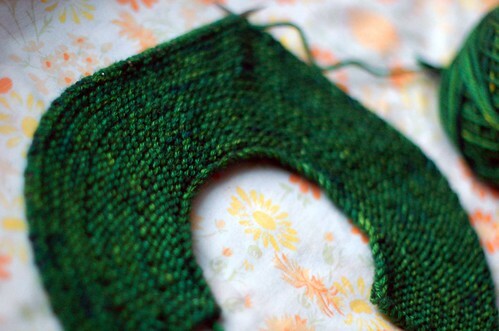 The greens are so rich, it will be a wonderful baby sweater. That is a very cute pattern and the green is just lovely. S/he will be a lucky baby. Wow, that color is so gorgeous, it's got such a depth to it. The sweater will be wonderful, what a special gift for a new baby! i absolutely love that baby cardi pattern! and sundara's yarn - drool. gorgeous. you have a brill weekend, too! Okay, anyone who can say they are "working their way through [their] Sundara stash" just needs to SHARE, man. Broken record statement: that color is fantastic. I was about to order the Skye Tweed, too- for the Central Park Hoodie. Wonder if we're after the same color? What a lovely cardigan and I love the green. Have a great trip, and don't blow away. I've never seen Sundara in person. I'll have to keep an eye out for it. That color is gorgeous! Very emeraldy. Like a knitted jewel. Fabulous color selection. It will make a stunning baby sweater for sure. You're coming to Chicago this weekend??? Eek! :) Yes, we are unusually windy at the moment (and freakin' freezing), but I'm going to keep my eyes open for ya so if a freaky lady comes running full-speed at you brandishing her dpns fear not - it's just me. Ok, you should still fear a little. Love the Sundara - she's amazing. What a great green! For me, green is a hard one to find in a shade/tint/hue (whatever) that I like. Wow, that's pretty intense and gorgeous. I am soo tempted! 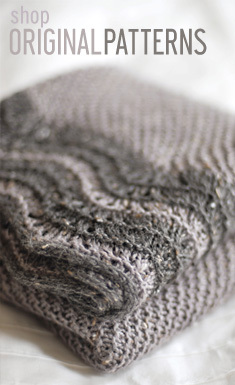 doesn't she make you fall in love with garter stitch? 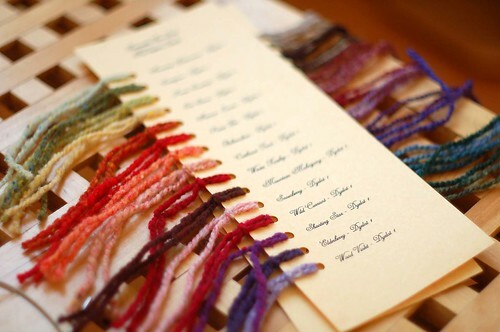 it makes that yarn looks particularly lovely. I'm knitting my EZ seamless saddle in Skye Tweed (Highland Cow Brown- it's got yellows and pinks and reds and greens and just gets better the more I knit). You're gonna love it. That green Sundara makes my mouth water. It's really hard to find a good green. That baby sweater is totally sweet. Lucky little one. I was thinking of ordering the Skye Tweed for Ariann (ChicKnits), but how would you guess it might be for someone a tad sensitive to wool? I usually only choose merino, but I love the colors & the price is amazing. This is EXACTLY the green I have been looking for for a shawl project, and I was wondering if Sundara would be a good person to go to. Now I know. Thanks and have a good trip! are you coming our way? i live in chicago. and it living up to the name this weekend! So if I'm one step ahead of you, does it mean you'll do the kneesocks next too? :) That babysweater is going to be GORGEOUS. Have fun in Chicago! When I saw Elli's baby sweater, I felt compelled to knit it to, even though I have no babies to knit for. That shade of green is *fantastic*. I too am a huge Sundara Yarn fan and am currently enjoying her Petals Collection. 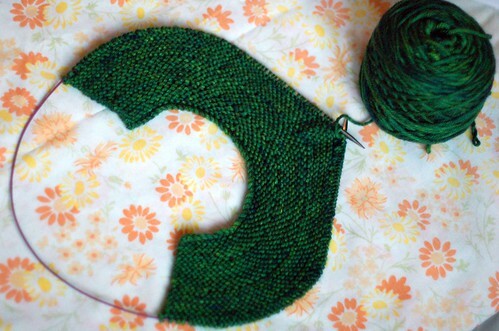 I must be honest and admit that I'm feeling knitter's envy for your beautiful green yarn. I kind of felt like an idiot last night when a bunch of us knitters were out for drinks (and knitting). We were talking about your site and it wasn't until that conversation that I learned you were a knitter of the male persuasion (I confess, I normally just look at the pics and skip the words on blogs). Normally you would think this would cause a surpirsed reaction. Me? I think I turned green with jealousy that a boy knitter was knitting so much better and so much more interestingly than me, a girl knitter, ever will. I'M LOVE THE GREEN. GREEN OVER YELLOW IS FANTASTIC! Pretty pretty. Green is my favorite color. And you were right about Kristine Jepson! And what about that Ben Heppner! That baby sweater is a favorite of mine -- so simply constructed and so elegant -- and this yarn will make it even more wonderful! Did you see the $3.99/ball Skye Tweed at Webs? Is that the sale you are talking about? I've been trying to pick my favorite color for a Sunrise Circle Jacket ever since I saw your post....wish I had a color card, I'm not trusting my monitor! Beautiful baby jacket, too. I will umpteenth the "great colour" vote! And your garter stitch is so nice & even; it really adds to the beauty of the yarn. This is going to be one lucky baby. Wow. Your photography is just stunning, as is the yarn. You have such an eye for color. What a lucky baby. I was just reading the EZ baby sweater pattern on my subway commute. I can't wait to see how yours turns out. This is going to be a fabulous baby sweater. Sundara's yarns are so wonderful- and this green amazing! I'm currently working on some tweedy socks, so I had to say Hi! Just discovered your blog while "surfing" others...woah! A guy who knits. A rarity where I'm at and what a delightful surprise! 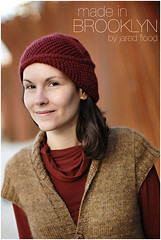 I looked at all your finished photos and am impressed that you went from hats (2005) to intricate shalls and sweaters? How does one move from easy to intricate? I have yet to figure that out. And has no one ever asked you who taught you to knit? How old were you? That sort of stuff? I'm asking...just in case you'd care to share that part of your knitting life. Great photos and beautiful final projects. To echo the above commenters - great colour. Knitters are finally moving on from the typical 'baby' pastels of yesteryear.